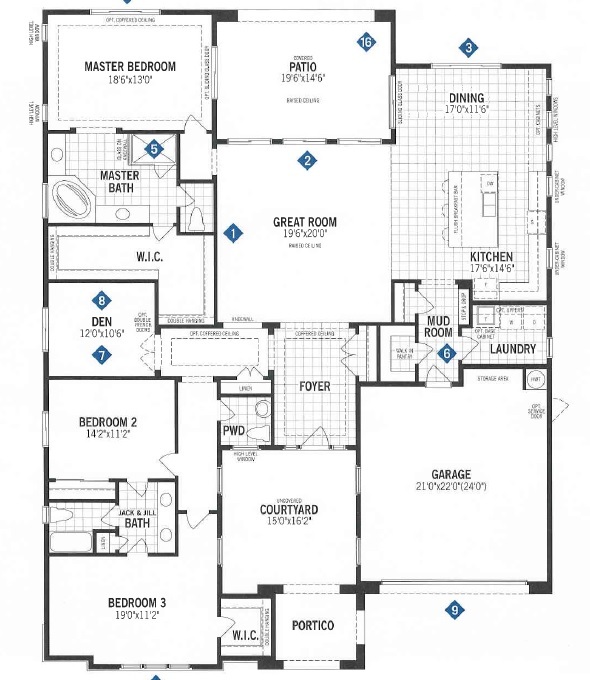 The Mattamy Homes Artesa Floor Plan is one of 9 available floor plans offered by Mattamy Homes Dove Mountain. The Artesa Floor Plan is in the Peak Series of Homes in Dove Mountain that includes homes with 2,762 to 3,277 square feet of living space. For those looking for a large home to retire too or winter retreat with lots of guests, the Mattamy Homes Artesa Floor Plan may be for you. Mattamy Homes Artesa Floor Plan offers 3 elevations for architectural styling and floor plan options to create your perfect home in Dove Mountain. Mattamy Homes is a privately-held new home builder based in Toronto Canada. Mattamy Homes has been building homes since 1978 and is a prominent builder across Canada. They have built over 60,000 homes in Canada through 2015. Mattamy Homes entered the U. S. market in 2003, with a project in Minneapolis, MN. Today, Mattamy Homes has developments underway in seven major U. S. markets. Minneapolis-St. Paul, Charlotte NC, Jacksonville FL, Orlando FL, Tampa-Sarasota FL, Phoenix AZ and now Tucson AZ. Mattamy Homes AZ has built over 650 homes since June 2013 in their Eastmark and Kenwood at Verrado communities in the Phoenix area. Their success in the Phoenix market brought them to the Tucson Real Estate market and the Mattamy Homes At Dove Mountain community. In addition to the Mattamy Homes Dove Mountain development, Mattamy Homes will be opening a development in Oro Valley AZ in mid-2016. This new Mattamy Homes AZ community will be on the east side of Rancho Vistoso Blvd. just north of the Hohokam Mesa subdivision. Mattamy’s Dove Mountain community is the first Tucson project for this prominent builder. Mattamy is the largest privately held home builder in North America. Their Dove Mountain development will offer great views, natural landscapes, and home features to meet buyer’s expectations. If you want to see the Mattamy Homes Community in Dove Mountain, give us a call – 866 316 5575. We would be pleased to discuss your home buying interests and the many Tucson AZ lifestyle choices and many new Dove Mountain homes under $575,000 just north of Tucson AZ.